Although pertussis or whooping cough can be prevented with a vaccine, it remains a big problem in the United States and throughout the world. Unlike most other vaccine preventable illnesses, the immunity from the pertussis vaccine wears off, and so teens and adults have been at risk of getting whooping cough, even though they got their shots as a child. Teens and adults can now get a new Tdap vaccine that boosts their immunity against whooping cough, so rates of infections will hopefully soon decrease. When parents think of whooping cough, they often think of a child who is having coughing spells that are followed by a 'whooping' sound. Although that is the characteristic or classic sound that kids with whooping cough make, remember that not all kids will have it. Instead, some kids just have coughing spells, others cough until they vomit (post-tussive emesis), and some just have a chronic cough. Whooping cough usually begins with a catarrhal stage though, about 6 to 20 days after being exposed to someone else with whooping cough (incubation period), with symptoms similar to a typical viral upper respiratory infection, including a low grade fever, runny nose, and cough. It is during this stage, which usually lasts 1 to 2 weeks, that a person is most contagious to others. The disease then may worsen during the next paroxysmal stage, which lasts 2 to 4 weeks, with children getting severe spells or paroxysms of coughing, which may be followed by a whoop and vomiting. These spells can be triggered by factors such as crying or eating. These coughing spells then slowly improve and become less frequent during the last convalescent stage, which lasts another 1 to 2 weeks. Altogether, symptoms might last for 3 to 10 weeks. Although the initial diagnosis of pertussis is usually based on the characteristic symptoms, testing is available. It includes a culture of nasal secretions; however, it can take 10 to 14 days to get the results, after which time your child has likely passed the infection to many other people. A quicker test, which may not be as accurate, is a DFA (direct immunofluorescent assay) of nasal secretions. Although pediatricians will likely be unable to do this test in their office, it can be done by a local lab, the local health department, or it can be sent out elsewhere by your pediatrician's office. An additional test, the polymerase chain reaction test (PCR), is faster and more accurate than other testing but may not be widely available yet. 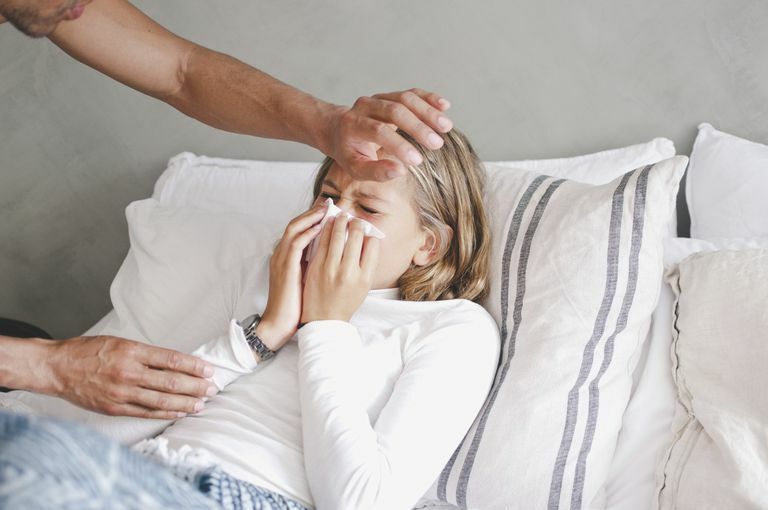 Although children can recover from pertussis without antibiotics, treatment, especially if started early during the catarrhal stage, may help them get better faster and be less contagious to others. Erythromycin is usually the antibiotic of choice for whooping cough and it is typically taken for 14 days. Alternatives may include Clarithromycin (Biaxin) for 7 days, azithromycin (Zithromax) for 5 days, and Bactrim for 14 days. While most children should not have any of the aforementioned complications and can be treated safely at home, younger infants, especially those born prematurely, may need to be hospitalized. Whooping cough is caused by the Bordetella pertussis bacteria. Vaccines that protect children against whooping cough include the DTaP vaccine that is given to young children and the Tdap booster that is given to older children, teens, and adults. Because babies don't receive their first DTaP vaccine until 2 months old, pregnant women are advised to get a Tdap vaccine between weeks 27 and 36 of pregnancy. That way, they'll pass protective antibodies to their babies that help guard against pertussis during their child's first two months. The pertussis bacteria is highly contagious and can be passed from infected people through respiratory secretions, so avoiding breathing these secretions (advise teens to cover their mouths when they cough), keeping newborns and infants away from coughing teens and adults, and washing hands often may also help prevent others from getting sick. For children that have close contact with someone with pertussis, prophylactic or preventative treatment with erythromycin, azithromycin, or clarithromycin might help prevent them from getting sick and is actually recommended for all close contacts including family members and peers at daycare or school. Antibiotic prevention is recommended even if the child has had all of his immunizations and no matter how old he is. Newborns and young infants with whooping cough may have apnea or periods where they stop breathing. The whooping cough diagnosis is often overlooked in adults since they may have a lingering cough instead of severe symptoms. Lebel MH - Pediatr Infect Dis J - 01-Dec-2001; 20(12): 1149-54. Efficacy and safety of clarithromycin versus erythromycin for the treatment of pertussis: a prospective, randomized, single blind trial. Gershon: Krugman's Infectious Diseases of Children, 11th ed. Martinez, SM, Kemper, CA, Haiduven, D, et al. Azithromycin prophylaxis during a hospitalwide outbreak of a pertussis-like illness. Infect Control Hosp Epidemiol 2001; 22:781. Recommended Antimicrobial Agents for the Treatment and Postexposure Prophylaxis of Pertussis. 2005 CDC Guidelines. MMWR. December 9, 2005 / 54(RR14);1-16. Does Your Child Really Need a Flu Shot? How Many Immunocompromised Kids Are There?